The 2015 Goosebumps adaptation was a fairly well-received homage to the classic children’s horror series of our collective ‘90s kid youth—nothing to set the world on fire, but full of enough callbacks to classic Goosebumps stories to be nostalgic fun for adults while entertaining and amusing the kids in the audience. At the very least, it did well enough to earn a shot at a sequel, which until recently was meant to be called Goosebumps: Horrorland, a reference to a specific, amusement park-themed entry in the series. However, according to ComicBook.com, that title has changed, and it suggests a different possible direction for the sequel: Slappy’s Revenge. The titular “Slappy” is of course the evil, living ventriloquist dummy first made famous by R.L. Stine’s classic Goosebumps book, 1993’s Night of the Living Dummy. He went on to appear regularly in numerous sequels, with names like Bride of the Living Dummy and Son of Slappy. 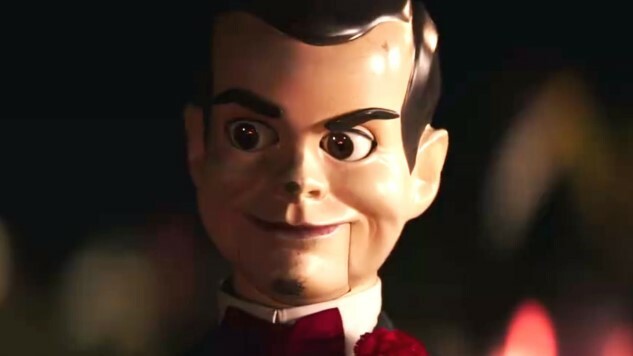 In the film, Slappy was voiced by Jack Black, who also pulled double duty as the fourth wall-breaking series creator R.L. Stine. It’s not known whether he would be reprising the role in the sequel, but one would hope that the precious Goosebumps continuity could be maintained. Filming on the Goosebumps sequel is speculated to begin in the first half of 2018, which wouldn’t leave much time for a Halloween-ish release window. Fans may be waiting until 2019 for another Goosebumps, but we know better than to completely count Slappy out.